Techkon announces a multi-press closed loop color control implementation with Ripon Printers, headquartered in Ripon, WI. TECHKON – the innovation leader in high-precision color measurement solutions for the global print and packaging communities – announces a multi-press closed loop color control implementation with Ripon Printers, headquartered in Ripon, WI. Ripon Printers specializes in the production and distribution of catalogs, direct mail and digital communications for small and mid-size catalog marketers. They offer a full complement of coldset and heatset web presses as well as sheetfed offset and digital equipment – all in a wide range of sizes and color configurations. With a goal of increasing efficiency and reducing waste while also improving color consistency, the Ripon Printers team of experts felt the Techkon PressLink Closed Loop Solution was the best possible choice for their plant. The team chose the solution because of its accuracy, rich feature set, ease of use, and competitive pricing and is pleased to report that make ready times and paper waste have decreased by almost 50% within the first 6 months of using the closed loop system. Also contributing to the measurable success of the implementation has been Techkon’s superb customer service and technical support. Techkon prides itself on its laser focus in supporting customers throughout the implementation process. The technical support team at Techkon is committed to zero instrument downtime and 100% customer satisfaction. Techkon USA’s line of densitometers, spectrophotometers, and software solutions serve a wide range of customers in commercial, corporate, and package printing facilities. Techkon’s handheld device offerings provide a perfect entry point into user-friendly, precise color control. With Techkon products, customers yield dramatic gains in quality, productivity and cost savings. Techkon’s entire product line is recognized by leading industry organizations, and its products are positioned as the color measurement tools of choice for printers around the world. For more information on Techkon USA’s products and services, please visit http://www.techkonusa.com or call us at 978-777-1854. Techkon is the innovation leader in densitometers, spectrophotometers and color software solutions for the global print community. With a track record of 30+ years of continued technological excellence, Techkon products are chosen for their high degree of measurement accuracy, repeatability, reliability and ease of operation in all sectors of the printing industry. 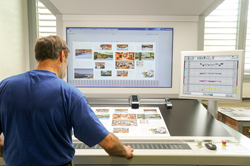 Techkon’s innovative color measurement solutions have led to highly successful implementations by leading OEM press manufacturers and large commercial printers, yielding dramatic gains in quality, productivity and cost savings.